What’s life like after university? Well for one it’s not a walk in the park. You either feel as if a huge weight is off your shoulders or that the real hard work is only about to begin. A recent report suggests half the UK’s leading employers said they received more completed graduate job applications during the early part of the recruitment season than they had in 2016 and two-fifths also believed the quality of applications had improved. In addition, the majority of this year’s graduates expect to start a full-time job within six months of graduating. But what is the rush? I’ve always been interested in embarking on a career in PR but I wasn’t completely certain what it entailed. 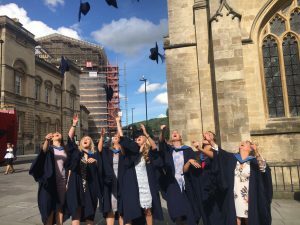 However, I wanted to go to university and complete a degree in communication, and so I found my feet in the beautiful spa town Bath. I was drawn to a city which offered a leisurely experience and a broad degree, with the intention of having a greater variety upon graduation. In my final year, I decided to venture into PR, which led to a part-time job with a small PR firm while completing my studies. I’ve always been a confident communicator and enthusiastic writer, so PR seemed to be the perfect fit. Juggling my dissertation, three modules, working as editor of a university publication, my desire to play sport, as well as my job, was difficult at times, but my persistence and willingness to learn eased the stress of it all. Although university does not prepare you for the simpler tasks, such as mass emailing, admin cover, and filing, these skills can be learnt through work placements and internships. Experience is key after all. While studying a bachelor’s degree is an essential requirement, employers are most interested in the experience you’ve had. From a young age, I knew I would have to complete many unpaid work placements and internships to get my foot into the door but I was unsure of the extreme lengths any student must go to. Many friends acquired excellent internships at well-known, large companies but they were expected to work unpaid and either find accommodation in the city or commute from home. Some people were lucky and had the funds to move closer to their workplace, while others faced the dreaded daily commute. Yet neither person knew whether the experience would lead to future prospects. Despite this, students know completing work placements are a necessity to building up their portfolio and networking for graduate jobs. Internships have become the new path leading students from education into employment. They’re a fantastic way of gaining insight into a certain industry, whether you decide to continue in the industry or not. Some employers are beginning to recognise the hardship of graduate employability, while others continue to exploit it. Another survey highlighted the rise in internships across the UK, leaving a loophole for companies wanting to employ qualified graduates on low pay or unpaid placements. This is due to the volume of graduates competing in the graduate job market and from personal experience it has become increasingly competitive. When applying to graduate schemes at large firms the process can be quite harsh and you may not even hear back from certain employers due to the volume of applications they receive. However, there’s always an opportunity you have the ability to take. Sometimes you must start small to make it big. The former head of University and Colleges Admissions Service (UCAS), Mary Curnock Cook, wants parents to encourage graduates to move back home and explore their options, in an effort to remove the “obsession” with careers. Many employers plan to increase graduate recruitment and salary intake, creating more opportunities for entry-level applicants throughout the year. Should graduates feel pressured to find work straight after graduation? After completing my studies, I worked as a receptionist to fund my trip to Australia in the summer. While some argued that I should’ve applied to the September intake of graduate schemes, I wanted to miss the rush and apply for jobs upon my return in October. I felt as though I had completed enough internships in my life, so I could turn my hand straight to junior-level jobs. I applied to some jobs through recruitment websites but the majority of my applications were found through Google searches in the vicinity of my home, which ultimately led me to Newsline PR. So here I am, your new PR account executive. My advice to all graduates would be to never give up hope. Undertaking these work placements and internships are exhausting but they will most certainly lead you to great contacts and other opportunities. The most vital ingredients are persistence and determination. University and work experience will help you in many ways to learn life skills and further your knowledge in a particular field but having the will to learn and being relentless will take you where you want to go.